Wristwatches are unabashed engineering feats that no longer just tell the time; they do so in two or more time zones, measure lap times in a race car, display the phases of the moon, and even keep track of golf strokes (no kidding, check out Richard Mille), all the while with high accuracy, mostly water-resistant, and almost always, beautiful. When it comes to a wristwatch, dial design plays a phenomenal part of the entire creation. Trying to fit all this extra information onto a display the size of a piece of sushi takes serious skill and a keen eye for functional aesthetics. Let’s look at some watches that have stood up to the challenge brilliantly. 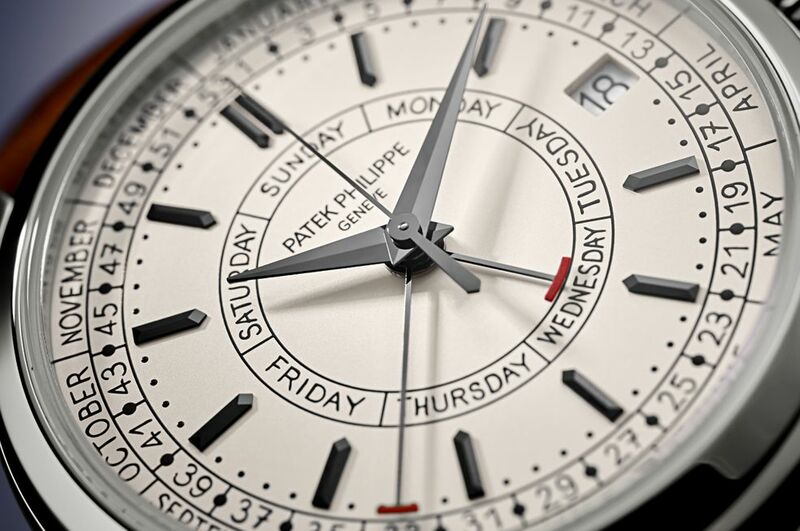 A brand new model by Patek Philippe, this new complication is an addition to their range of calendar watches. In addition to the day and the date, the weekly calendar now displays the current week number. It is incredibly useful for the active man of today, even in the era of the ubiquitous smartphone. The silver dial combines a distinctive layout with great legibility, a masterpiece in displaying the maximum amount of information necessary onto a dial, yet retaining a clean aesthetic that is easy to understand. Its typography is designed especially for this watch and is a reproduction of actual authentic handwriting. Each letter and number are different and unique, just like hand written notes, valued and cherished by the individual. The days are arranged on a ring framing the dial center, and a hammer-shaped hand with a red-painted head indicates the day. A similar hand points simultaneously to the month and the week number on the periphery of the dial. Powered by a new self-winding caliber, 26-330 S C J SE, comprised of 304 parts and visible through the sapphire crystal exhibition case back, the new Calatrava Weekly Calendar Ref. 5212A-001 is also the only steel Calatrava in Patek Philippe’s regular collection. Billed as the only mechanical watch perfectly readable underwater, the Ressence Type 5N is a new example of the original oil-filled Type 5 watch, now featuring a deep night blue dial. 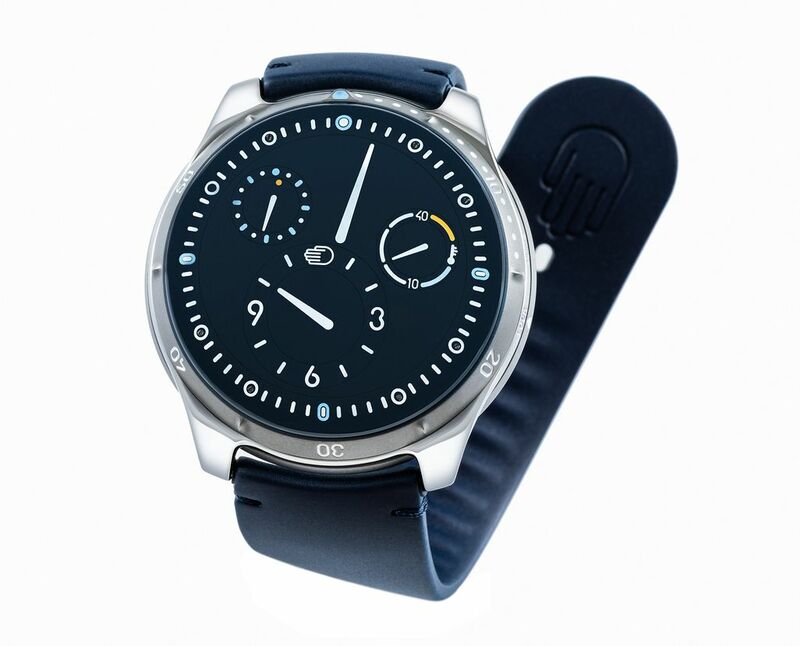 The origins of the watch revolve around the Ressence Orbital Convex System, a wholly unique in-house developed and patented system that features an ever-changing dial of rotating discs in continuous orbit. These discs, under the protruding domed crystal, are indeed extremely visible underwater. The combination of the dome and the oil in the case prevents any visual distortion and ‘mirroring’ while diving. In the quest for a more efficient way of telling time, all information is displayed on a single surface, unlike traditional watches where the hands and dial are layers on one another, producing an uneven viewing plane. The Type 5N executes this in an absolutely modern manner, with a deep matte night blue dial spiced with white printed indexes and indicators strategically spiced with little pops of pastel blue and a unique shade of orange. While the Type 5N may just be another pretty face on the surface, a closer look proves it to be anything but. The most important information for divers is the minute hand, and that takes center stage on the watch, the largest and most legible hand. Hours are displayed in the next largest subdial. Two other subdials for a 90 second runner and a temperature gauge complete the offering. By measuring the effects of expansion and contraction of the oil, the watch is able to indicate the temperature of the oil, and in doing so, depicts a safe operating temperature range. Perfectly at home underwater or above, the Ressance Type 5 is a fine example of a dial that combines function and legibility in an absolutely modern aesthetic. 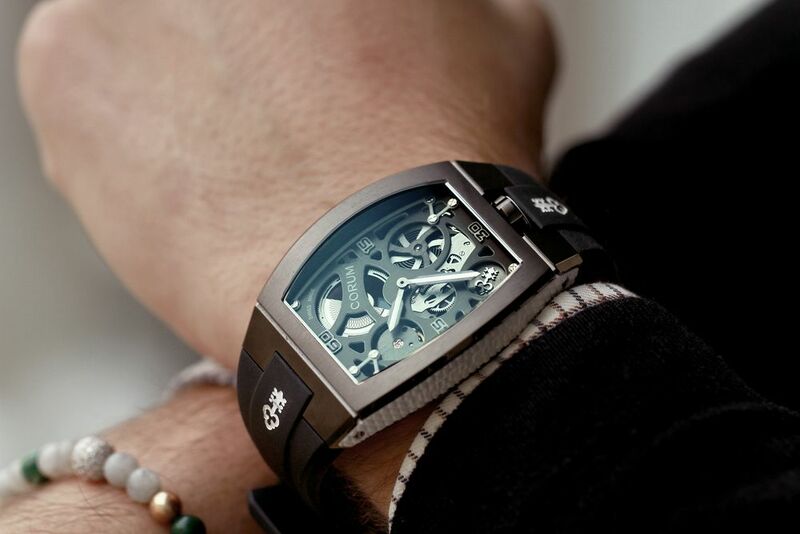 In a disruptive, contemporary approach, Corum has created a ‘Lab’ collection, where mechanics takes precedence, looking towards the future and embracing new technology and styles, yet firmly with respect to the past and the heritage of the brand. The new wristwatch features a stunning open-worked dial that is reduced to its simplest expression. A flat, grey anthracite sheet with strategic cutouts expose the CO 410 skeleton calibre that fits snugly in the case. Interestingly, this is also a rare instance where the micro-rotor is visible from the dial side. 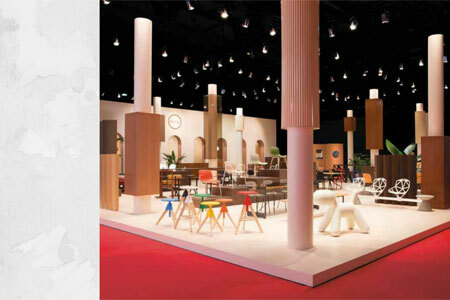 It features a contemporary spiral finish that accentuates the effect of speed as it begins to rotate. While most watches have a face and a back, the Lab 01 has blurred the lines in a single skillful execution. The Lab 01 features a barrel-shaped case made entirely of black DLC, and houses a rare unicorn in modern watchmaking. Powering the watch is a “shape movement”; a movement that has been made to measure specifically for the specific case. Unlike how the majority of other watches are made, the caliber and the case are closely intertwined, one molding to the contours of the other. A perfect example of the future of watchmaking.